Furiends I’m so excited to tell you that I’m in Reader’s Digest! They’ve said some really nice things about me and used one of the photos I’m most proud of. Me climbing back aboard Nocturne after a swim! To read and enjoy the slide show just click here! « Purrfecting the work life balance. Oh My Dog! That’s pawesome Bailey! Woooooowoooooooooo! Wowza Bailey!! You are famous!!! You look kinda scared there, Bailey! A genuine celebrity, you are! Yikes, I sound like Yoda. Imagine…..Readers Digest. I am awe struck….way to go Bailey. WE reedz Reeder’z Diegest when we can find it!!! We will defo look fer da artickull ’bout me sweet swimmin Brofur!! WE lubz ya famuss Brofur!!!! Well that is really neat! Congratulations to you Bailey and your human; you are getting to be quite famous! Wow, Bailey, that is so awesome! Congratulations. All the photos are great! OMC Bailey did yous do dat on purrpuss? 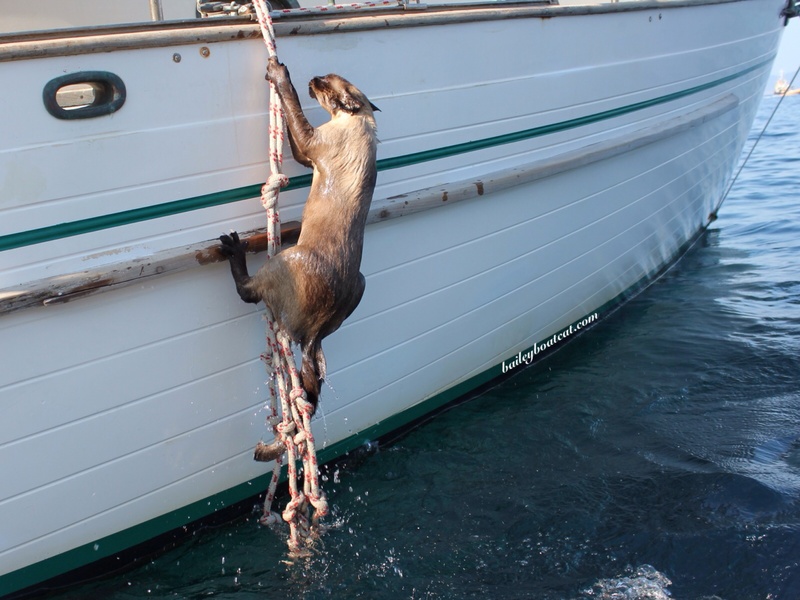 Yous look gweat climbin’ up dat rope, but dat’s a weally skeery place to go fur a swim. ConCats on bein’ in da Reader’s Digest. Wow – No way!!?? Readers’s Digest? Bailey you ARE famous. Well done you and Mum. Congratulations Bailey! That’s wonderful to be in Reader’s Digest…..super job my friend….should be GREAT for book sales too…..that shot of you climbing the rope is fabulous – always been one of my favorites! You scared me for a minute bailey! Oh and congratulations of course! for being in RD. 🙂 Way to go! Oh my goodness, that is great. 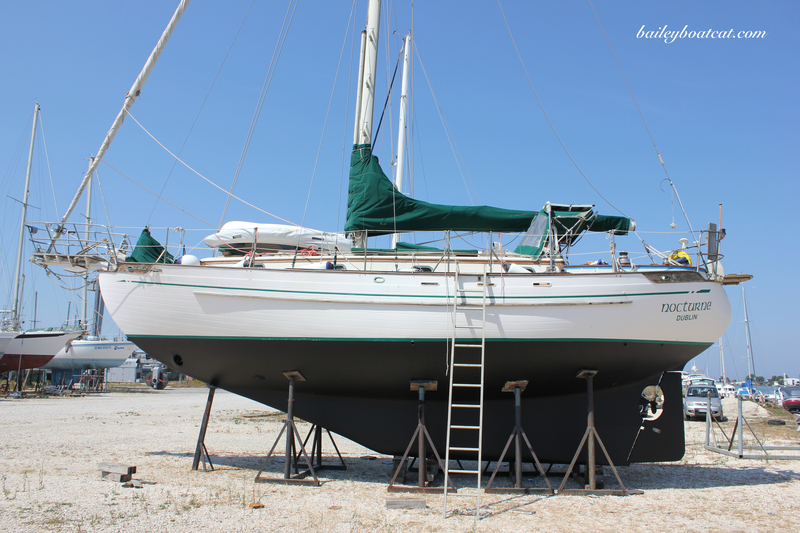 I’ll have to look for the issue and wow, look at you climbing back onto the boat after a swim. I am amazed and impressed. Huge concats, Bailey! What a thrill for you and your humans! OMC, Bailey, that is REALLY amazing! Congratulations on being featured on Readers Digest! So exciting! They chose some of our favorite shots of you, B. I love you on the solar panels. Wow that IS an achievement for a cat! Congratulations Bailey … we need cats like you in Australia! You are a star, Bailey! An excellent write-up, and the photos of you are fantastic! Don’t let all the fame go to your head, ’cause you won’t be able to fit in all your nooks and crannies…lol! Congratulations! Wow, Bailey! You just keep getting more and more famous! Whoo Hoo! Well done Bailey! And that photo is … well wet and soggy as! 🙂 Showing some muscle too!